The Royal Wedding of Prince Harry and Meghan Markle will be Saturday May 19th 2018 why not design a fabulous self-portrait tea towel for your school, nursery, playgroup or pre-school! They’re a fantastic keep sake and great value too. We provide a free kit for you to create your own personalised tea towel design, along with step-by-step instructions. If you have any questions, please contact our team who can help and advise you on the process of creating your own design. With our special personalised tea towel border, we’ll add your school name in to the top of the border, free of charge. 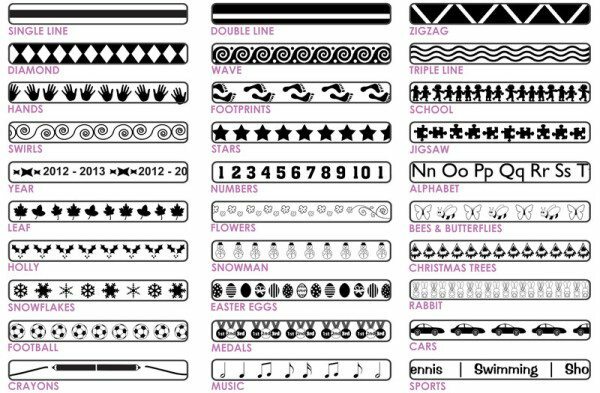 The year is also included in the bottom of the border to commemorate when your design was made. Prices are based per design on a single colour print. Our printed school tea towels measure 79cm x 51cm (printable area 71cm x 43cm). They are 100% premium cotton (white or natural). Free delivery in the UK. All prices exclude VAT. Reprints available from a quantity of just 20. Call us for more information. They are available in standard white or unbleached natural. The art pack includes everything you need. It has been carefully thought about and the whole process is simple to complete. Our pack includes, drawing paper, templates, pens, tea towel sample, freepost return address label. Our kits are sent out in bright pink tubes, which can be kept and reused for sending artwork back to us. We can also accept artwork digitally, however please contact us for more information on how to set the design. For best results we recommend using our pack. 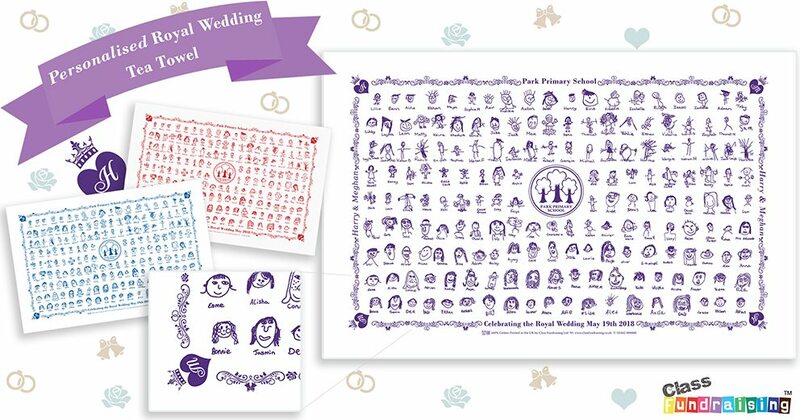 We have over 20 print colours to select from for your self-portrait Royal Wedding tea towel. PTA’s Love School tea towels! A wonderful, artistic and great fundraising idea that is simple and easy to do at your primary school, nursery, preschool or organisation. School tea towels are so good is because of their is their simplicity, their low price and their keepsake value. Our unique process is designed with PTA members in mind, which makes the whole process simple to do and more importantly makes your organisation extra funds, we pride ourselves on printing and provide a first rate service. We also offer FREE DELIVERY, NO SET UP COSTS, FREE ART KIT and PRICE MATCH PROMISE. This Christmas we’ve also added 3 sparkly GLITTER PRINT COLOURS, which are great for festive designs. If you are a PTA searching for ideas to fund raise this year we can help out with our simple to follow process to create a unique piece of creative artwork that is then screen printed on to tea towels. We have over 15 years experience in providing a fundraising service. We guarantee that your school or organisation will be knocked out by the results we achieve.